We chose this area because it was not too 'touristy', the beach was across the road & we had a view of Mt. Etna! We were not disappointed. The apartment is comfortable, has a small kitchen perfectly adequate for preparing meals to eat on the balcony. The bedroom was spacious, air conditioned, with a large comfy bed and a balcony overlooking the nice gardens with water feature. Shower room (small entrance to shower, so larger guests may have difficulty), comfy lounge/diner & another balcony with uninterrupted views of Etna and lemon trees. Seating & tables on both balconies, with sun awnings. A huge roof terrace, which could be better utilised - there were no sun loungers up there, which would have provide somewhere comfortable to lie out in the sun within the apartment. All amenities are available in the immediate area; excellent fish, fruit & vegetable shops, supermarkets and smaller local businesses. Cafes, bars, restaurants are all within walking distance, although the road is very busy. A garage is available and that & the apartment are within a gated area. The shingle beach is directly across the road and the sea was very nice. The local people are friendly & helpful. There is a railway station via which one can get on the train that circumnavigates Etna, although with a hire car, we did it that way - well worth it. The trip as near as one can get to the craters at the summit, via cable car and 4-wheel drive (or walking), is a must. The only disappointing aspect of the Sant'Anna and Riposto is the amount of rubbish everywhere. We were not sure if there was some kind of industrial action, but bins did not seem to be emptied & the dumpsters were overflowing; full bin bags and litter lined the streets & roads, & the beach was very littered, so we did not use it very often at all. However, the apartment & grounds were well kept & the above negative comments are no reflection on the apartment. The owners were extremely helpful & friendly - lovely people. Directions were provided & they met us outside the area for us to follow them to the apartment, where they showed us around & gave us necessary/useful information about the property. If the authorities cleaned up the area it would be perfect. "We are very happy to have a chance to spend a week in that apartment. Special thanks to owners for their kindness and hospitality. Many greetings from Poland:o)"
"We stayed in the apartment for a week in September 09, the flat was very clean and quiet (what we needed exactly) There are 2 balconies, one of them with a beautiful and peaceful view of Mount Etna. The flat is really nice and bright and has a lot of space, it is situated just across the road from the sea - very handy to go for a swim in the mornings! You can walk to the port and a town centre for shopping, restaurants or evening stroll. There are car/scooter rental on the same road (opposite direction from town centre) - you can easily explore surrounding areas - Taormina, Syracuse, Mt Etna. If you don't drive - there is a train station a walk away with trains running to Taormina/Catania. Owners are fantastic - very friendly and supportive and can give you a lot of tips about local area and provide you with help when needed (they gave us rain coats in a rainy day as we were riding scooter!) needless to say about the cake and a great diner we had together! 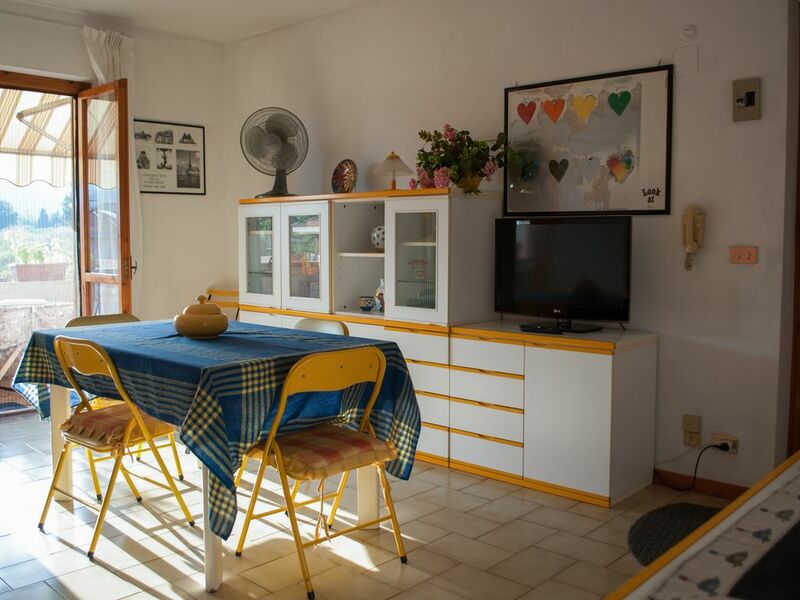 Definitely will recomend this accomadation to families, couples or friends who want to have a good base on the Eastern cost of Sicily to explore as well as pleasant and comfortable homely stay!" Logement spacieux et agréable, accueil très très gentil des propriétaires. Vue magnifique depuis la petite terrasse côté ouest. Localisation calme (Riposto est une petite localité très agréable si on se donne la peine de s'y promener un peu) et en même temps très pratique (accès rapides à l'Etna, à Catane, Taormina, Syracuse). Encore merci à Giuseppina !! Jacques e sua moglie sono stati gli ospiti ideali, molto gentili e cortesi. Hanno utilizzato l'appartamento con la stessa cura della loro casa. Molto raccomandati! Un vero piacere avere conosciuto Salvatore e la sua famiglia. Sono stati ospiti gradevoli, hanno utilizzato l'appartamento come una loro proprietà, con grande scrupolo e garbo. Siamo lieti abbiano goduto giornate felici e spensierate. Sarà bello incontrarli ancora. Cristina e la sua famiglia sono stati ottimi ospiti che hanno saputo gioire dei luoghi vicini alternando momenti culturali a momenti di relax al mare. L'appartamento è stato utilizzato alla stregua di una loro proprietà, una volta conosciuti è stata pienamente confermata l'idea di una famiglia simpatica ed educata che avevamo avuto durante le fasi della prenotazione. Sarà un vero piacere incontrarli ancora. Take the A18 motorway, exit at Giarre, go to the port of Riposto and after few meters on the left you arrive to destination. A few hundred meters there is a famous restaurant in Sicilian cuisine, an elegant restaurant in the port area where you can plan excursions to Taormina, to the Aeolian Islands and to the Etna volcano. Tariffe scontate in relazione alla durata. Tariffe in funzione del numero di persone. Caparra richiesta alla prenotazione. Consegna delle chiavi da parte del Proprietario.